Hudson County and regional mayors are questioning their relationship with Gov. Christie in light of the media feeding frenzy over the orange cone controversial lane closures in Ft. Lee at the George Washington Bridge. The temporary closure and ensuing added traffic has become the focus of the national media who are using the controversy to define Gov. Chris Christie, an anticipated Republican candidate for President in 2016. Gov. Christie appeared up the hill in Union City to collect this endorsement from State Senator Brian Stack. 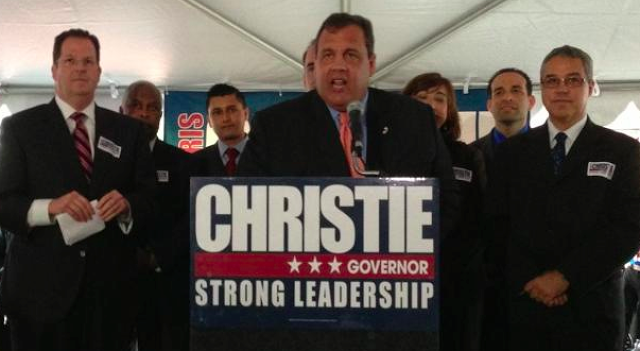 Christie also received an endorsement from Stack's selected Assembly pick Carmelo Garcia (rear right). The operative words here are Republican and President. The feeding frenzy has reached the Hoboken mayor's office where unsolicited media inquiries are arriving in the hunt. "Hoboken Mayor Dawn Zimmer says she had a face to face visit with Governor Christie in the Spring, when he asked her to endorse him for re-election. She told him she would be remaining neutral. She had applied for a Hazard Mitigation Grant to protect Hoboken from flooding. During Sandy, 80 percent of the city was under water." Hoboken requested $100 million in aid from the State and received a relative paltry $300,000. Some NJ Assembly officials are already talking about trying to use the controversy to launch impeachment proceedings against the Governor and one got himself on national TV over the weekend. This places one new Assembly-elect official in an odd position. Carmelo Garcia, he of the "ethnic cleaning" lawsuit thrown out of Hudson County Superior Court was handed an assembly position on the State Senator Brian Stack ticket last year. Part of the cost for the easy "ride" against token opposition was joining Stack in endorsing Gov. Christie. Garcia is expected to be sworn in for the two year Assembly position this week. Word is out all over New Jersey the reception for Garcia who was caught and admitted making tapes of others is icy. No one wants to talk about a mass communication selectively made to all NJ legislative officials suggesting any conversation with Carmelo Garcia begin with a pat down. No one wants to talk about it to MSV on the record or background but everyone is talking about it. A MSV exclusive photo captured this moment between Gov. 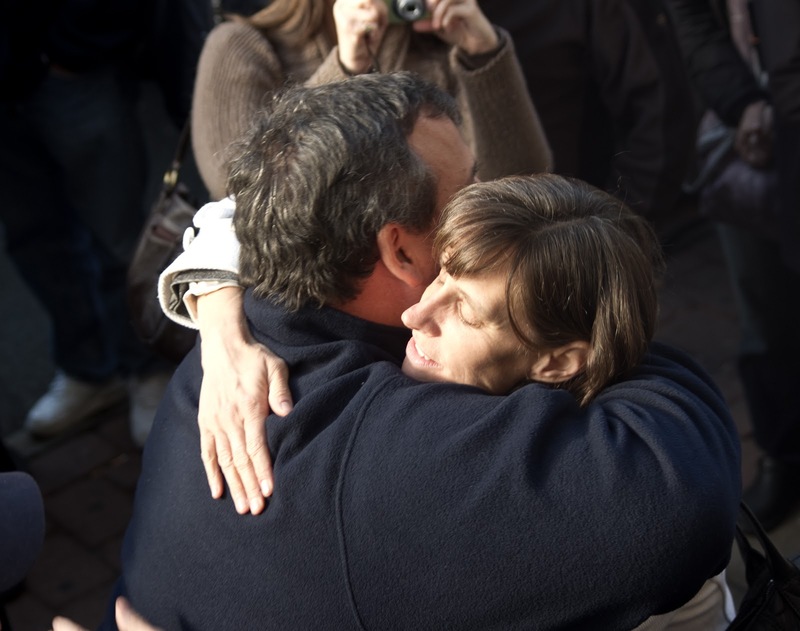 Christie and Mayor Zimmer outside the Elks Club on Washington Street during Hurricane Sandy. The Governor had made an impromptu visit to Hoboken after the storm. Talking Ed Note: A New Jersey Democratic Representative, Frank Pallone is featured a CNN story discussing federal investigators looking into Sandy funds spent in NJ, questioning if some of the funds were inappropriately spent by Gov. Christie.